Sorry to bring the bad news, but this game's clearly for the birds. 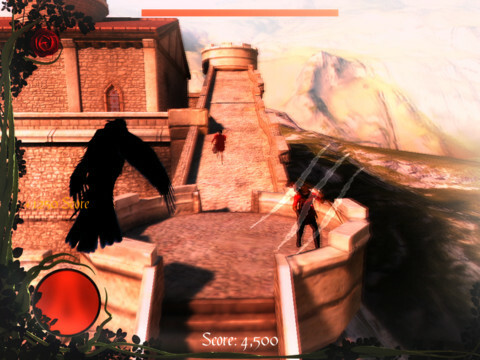 Based on early App Store reviews, iPhone and iPad owners love Crow, the newest release from Sunside Games. They dig it so much that we spent several hours trying to understand why, because this title...this mish mash of different elements, falls flat at almost every turn. It possesses a few ingredients for success, those being a cool and winged protagonist (a crow, FYI), a rich fantasy world populated by bizarre characters and stylish graphics that bring everything to life. What does it lack? Fun. First, don't ask us to explain the plot's intricacies, because we still don't know what this game's really about, and that's from reading the pop-ups that attempt to put everything in perspective. There's an evil scarecrow, evil trees, some evil ghost thing and a giant you seemingly protect at first, then battle. Why? Because it clearly must be evil. 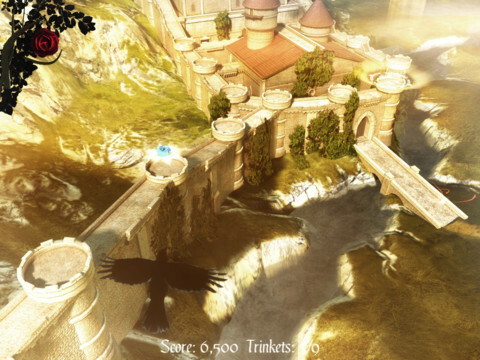 Beyond that, the developers broke the game into two portions: exploration and combat. The former employs a top down perspective as you slowly (and we mean slowly) glide around a slice of the world searching for gems and creatures to battle. Pretty scenery, no question, but the crow's movements literally put us to sleep with iPads in our laps. What's more, the creators ask you to direct the crow by placing a finger at the top of the screen, which of course obscures the playfield, depending on how big your hand is. Not entertaining, whatsoever. As for combat, this app transition to an on-rails, behind the back (perhaps tail) perspective. Here, you wait for a button to glow gold as you dodge attacks and projectiles, be it rocks or arrows. Then, when the crow gets close enough, you press that button and swipe the intended target, or encircle your feathered friend to activate a shield. Why is this annoying? Miss an enemy, and you watch the crow follow the same old route until making another pass. This means battles drag on much longer than expected. Not only that, but some enemies also sneak in cheap hits. Beware the aforementioned giant's humongous hand attack. It's a shame, because style is the one thing Crow has going for it. The snow-capped mountains, hayfields, twisted forests and caves make it unlike anything we've seen on iOS, and the concept of attacking monsters as a crow sounds great. At the same time, the cornball story, overall slow pace and lame combat make this one game we'd like to forget. So long, $4.99. What's Hot: Some of the best graphics we've seen on iPhone and iPad, viewing things from a crow's perspective. What's Not: Nonsensical story, slow-paced exploring, weird controls, monotonous combat.